J. V. Stalin, Works, Foreign Languages Publishing House, Moscow, 1954, Vol. 8. I think that the attitude of Hansen and Ruth Fischer is wrong. They demand that the fight against the Rights and "ultra-Lefts" should be waged always and everywhere, under all conditions, with equal intensity, on the principle, so to speak, of equity. This idea of equity, of striking at the Rights and "ultra-Lefts" with equal intensity under all conditions and circumstances, is childish. It is one that no politician can entertain. The question of the fight against the Rights and "ultra-Lefts" must be regarded not from the standpoint of equity, but from the standpoint of the demands of the political situation, of the political requirements of the Party at any given moment. Why, in the French Party, is the fight against the Rights the immediate urgent task at the present moment, while in the German Communist Party the immediate task is the fight against the "ultra-Lefts"? Because the situations in the French and the German Communist Parties are not identical. Because the political requirements of these two Parties at the present time are different. Germany has only recently emerged from a profound revolutionary crisis, when the Party was conducting its fight by the method of direct assault. Now the German Communist Party is going through a period of mustering forces and preparing the masses for the decisive battles to come. In this new situation, the method of direct assault will no longer do for the attainment of the old objectives. What the German Communist Party must now do is to pass to the method of flank movements, with the aim of winning over the majority of the working class in Germany. It is natural under these circumstances that we should find in Germany a group of "ultra-Lefts" which keeps repeating the old slogans in a schoolboy fashion and is unable or unwilling to adapt itself to the new conditions of the struggle, which demand new methods of work. Hence we have the "ultra Lefts," who by their policy are hindering the Party from adapting itself to the new conditions of the struggle and from finding its way to the broad masses of the German proletariat. Either the German Communist Party breaks the resistance of the "ultra-Lefts," and then it will be on the high road to winning over the majority of the working class; or it does not, and then it will make the present crisis chronic and disastrous for the Party. Hence the fighting against the "ultra-Lefts" in the German Communist Party is the latter's immediate task. In France we have a different situation. In that country there has been no profound revolutionary crisis so far. The struggle there has proceeded within the bounds of legality, and the methods of struggle have been exclusively, or almost exclusively, of a legal character. But now a crisis has begun to develop in France. I have in mind the Moroccan and Syrian wars and France's financial difficulties. How deep that crisis is, it is difficult to say at present, but it is a crisis nevertheless, and one which demands of the Party a combination of legal and illegal forms of struggle, and the maximum Bolshevisation of the Party. It is natural under these circumstances that we should find in the French Party a group -- I am referring to the Rights -- which is unable or unwilling to adapt itself to the new conditions of the struggle, and which continues from inertia to insist on the old methods of struggle as the only correct ones. This circumstance, of course, cannot but hinder the Bolshevisation of the French Communist Party. Hence the Right danger in the French Communist Party is the immediate danger. Hence the task of fighting against the Right danger is the urgent task of the French Communist Party. A few illustrations from the history of the C.P.S.U.(B.). After the 1905 Revolution there arose in our Party, too, an "ultra-Left" group, known as the "Otzovists," which was unable or unwilling to adapt itself to the new conditions of the struggle and refused to recognise the method of utilising legal opportunities (the Duma, workers' clubs, insurance funds, etc.). As you know, Lenin resolutely fought that group, and it was after the Party had succeeded in overcoming that group that it was able to take the right road. We had the same thing after the 1917 Revolution, when an "ultra-Left" group< opposed the Brest Peace. As you know, our Party, under Lenin's leadership, smashed this group too. What do these facts show? They show that the question of the fight against the Rights and "ultra-Lefts" must be put not abstractly, but concretely, depending on the political situation. Is it accidental that the French have come to the Presidium of the Executive Committee of the Communist International with a resolution against the Right elements in their Party, and the Germans with a resolution against the "ultra-Lefts"? Of course not. The tongue ever turns to the aching tooth. Hence, the idea of equity, of striking at the Rights and "ultra-Lefts" with equal intensity, is untenable. For that very reason, I would suggest, deleting from the draft resolution on the "ultra-Lefts" in Germany the phrase which says that in the German Communist Party it is necessary to concentrate to an equal degree on the struggle against the Rights and the "ultra-Lefts." I propose that this phrase be deleted for the same reason that the phrase about concentrating on the struggle against the "ultra-Lefts" was deleted from the resolution on the Rights in the French Communist Party. That the Rights and "ultra-Lefts" must be fought always and everywhere is perfectly true. But that is not the point just now; the point is what to concentrate on at the present moment in France, on the one hand, and in Germany, on the other. I think that in the French Communist Party it is necessary to concentrate on the fight against the Rights, for that is demanded by political necessity at the present moment, while in the German Communist Party it is necessary to concentrate on the fight against the " ultra-Lefts," since that is demanded by the political requirements of the German Communist Party at the present moment. What is the position of the intermediate group in the German Communist Party -- the Ruth Fischer-Maslow group -- looking at the question from the point of view just expounded? This group, in my opinion, is diplomatically screening Scholem's "ultra-Left" group. The Ruth Fischer-Maslow group is not siding with the Scholem group openly, but it is doing everything in its power to weaken the force of the Party 's blow against the Scholem group. The Ruth Fischer-Maslow group is thus hampering the efforts of the Central Committee of the German Communist Party to overcome and eliminate the "ultra-Left" prejudices of the German Communist Party. The German Communist Party must therefore wage a determined fight against this group, the Ruth Fischer-Maslow group. Either the Ruth Fischer-Maslow group is smashed, and then the Party will be in a position to overcome the present crisis in the fight against the Scholem group; or the German Communist Party is taken in by the diplomatic wiles of the Ruth Fischer-Maslow group, and then the fight will be lost, to the benefit of Scholem. It seems to me that in the matter of the inner-party ideological struggle, Hansen is preaching a sort of parson's morality, one entirely unbefitting a Communist Party. Apparently, he is not opposed to an ideological struggle. But he would like to conduct it in such a way as not to discredit any of the opposition leaders. I must say that no such struggle ever happens. I must say that one who is prepared to tolerate a struggle only provided that none of the leaders is in any way compromised, virtually denies the possibility of waging any kind of ideological struggle within the Party. Ought we to disclose mistakes committed by party leaders? Ought we to bring those mistakes to light, so as to educate the party masses on the basis of the mistakes of the leaders? I think that we ought to do so. I think that there is no other way of correcting mistakes. I think that the method of slurring over mistakes is not our method. But it follows from this that there can be no inner-party struggle and correction of mistakes without some leader or other being in some way compromised. That may be sad, but nothing can be done about it, because we are powerless against the inevitable. Ought we to fight against both "ultra-Lefts" and Rights? Hansen asks. Of course, we ought to. We settled that question long ago. The dispute is not about that. The dispute is about which danger we should concentrate on in the fight at this moment in the two different Parties, the French and the German, the situations of which are at present dissimilar. Is it accidental that the French have come to the Presidium of the E.C.C.I. with a resolution against the Rights, and the Germans with a resolution against the "ultra-Lefts"? Perhaps the French are mistaken in concentrating on the fight against the Rights? Why, in that case, did Hansen not attempt to come to the Presidium with a counter-resolution regarding the fight against the "ultra-Lefts" in France? Perhaps the Germans are mistaken in concentrating on the fight against the "ultra-Lefts"? Why, in that case, did Hansen and Ruth Fischer not attempt to come to the Presidium with a counter-resolution concentrating on the fight against the Rights? What is the point here? The point is that we are faced not with the abstract question of combating Rights and "ultra-Lefts" in general, but with the concrete question of the immediate tasks of the German Party at the present moment. And the immediate task of the German Communist Party is to overcome the "ultra-Left" danger, just as the immediate task of the French Communist Party is to overcome the Right danger. How, for instance, are we to explain the generally known fact that the Communist Parties of Britain, France and Czechoslovakia have already obtained important footholds in the trade-union movements of their countries, have found their way to the broad masses of the working class, and are beginning to win the confidence, if not of the majority, at least of a considerable section of the working class, whereas in Germany the position in this respect is still weak? It is to be explained above all by the fact that the "ultra-Lefts" are still strong in the German Communist Party, and that they still look sceptically on the trade unions, on the slogan of a united front, on the slogan of winning over the trade unions. Everyone knows that until recently the "ultra-Lefts" upheld the slogan "Get out of the trade unions." 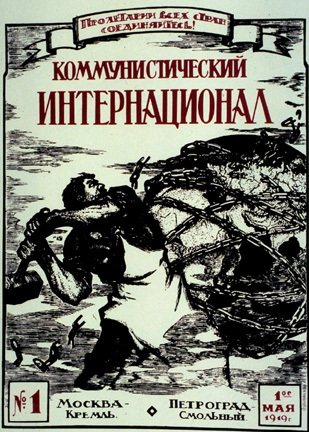 Everyone knows that survivals of this anti-proletarian slogan have not yet been completely eradicated among the "ultra-Lefts." One thing or the other: either the German Communist Party succeeds in speedily and decisively ridding itself of the prejudices of the "ultra-Lefts" regarding methods of work among the masses, after having utterly smashed -- ideologically smashed -- the Scholem group; or it does not succeed, in which case the crisis in the German Communist Party may take a most dangerous turn. It is said that there are honest revolutionary workers among the "ultra-Lefts," and that we must not repel them. That is quite true, and we are not suggesting that they should be repelled. For that reason we are not introducing into our draft resolution any proposal that any of the "ultra-Lefts," and least of all workers, should be repelled or expelled from the Party. But how are those workers to be raised to the level of political understanding of a Leninist party? How are they to be rescued from the misconceptions they are now labouring under owing to the errors and prejudices of their "ultra-Left" leaders? There is only one method of achieving this, and that is the method of politically repudiating the "ultra-Left" leaders, the method of exposing the "ultra-Left" errors which are misleading honest revolutionary workers and hindering them from setting foot on the broad highway. Can we tolerate putrid diplomacy, the slurring over of errors, in questions of the ideological struggle in the Party and the political education of the masses? No, we cannot. We should be deceiving the workers if we did. What, then, is the solution? There is only one solution, and that is to expose the errors of the "ultra-Left" leaders, and in this way help honest revolutionary workers to take the right road. It is said that a blow at the "ultra-Lefts" may lead to the accusation that the German Communist Party has swung to the Right. That is nonsense, comrades. At the All-Russian Party Conference in 1908, when Lenin fought the Russian "ultra-Lefts" and utterly routed them, in our midst, too, there were people who accused Lenin of Rightism, of having swung to the Right. But all the world now knows that Lenin's position at that time was correct, that his standpoint was the only revolutionary one, and that the Russian "ultra-Lefts," who were then making a show of "revolutionary" phrases, were in reality opportunists. It should not be forgotten that Rights and "ultra-Lefts" are actually twins, that consequently both take an opportunist stand, the difference between them being that whereas the Rights do not always conceal their opportunism, the Lefts invariably camouflage their opportunism with "revolutionary" phrases. We cannot allow our policy to be determined by what scandal mongers and philistines may say about us. We must go our way firmly and confidently, paying no heed to the tales idle minds may invent about us. The Russians have an apt saying: "the dogs bark, the caravan passes." We should bear this saying in mind; it may stand us in good stead on more than one occasion. Ruth Fischer says that later on the Right danger may come to be the immediate question for the German Communist Party. That is quite possible and even probable. But what follows from this? Ruth Fischer draws the strange conclusion that the blow against the "ultra-Lefts" in Germany, who already at this moment constitute a real danger, should be weakened, and the blow against the Rights, who may become a serious danger in the future, should be strengthened immediately. It will be easily seen that this is a rather ludicrous and fundamentally incorrect way of putting the question. Only a betwixt-and-between diplomatic group like the Ruth Fischer-Maslow group could land itself in such a ludicrous position in its effort to weaken the Party's struggle against the "ultra-Lefts," and thus save the Scholem group, withdrawing it from the blow. For that is the whole purpose of Ruth Fischer's proposal. I think that there must be a similar intermediate diplomatic group in France, one that is trying with honeyed speeches to shield the Right elements in the French Communist Party. It is therefore an immediate task of the day to fight the intermediate diplomatic groups both in the German and in the French Parties. Ruth Fischer asserts that if a resolution against the "ultra-Lefts" in Germany is adopted, it would only aggravate the situation in the Party. It seems to me that Ruth Fischer is anxious to prolong the crisis in the German Communist Party, to make it a protracted and chronic one. We cannot therefore follow the path of Ruth Fischer, for all her diplomacy and honeyed talk about peace in the Party. I think, comrades, that important Marxist elements have already crystallised in the German Party. I think that the present working-class core of the German Communist Party constitutes that Marxist core which the German Communist Party needs. The task of the Presidium of the E.C.C.I. is to support that core and assist it in its struggle against all deviations, above all against the "ultra-Left" deviation. We must therefore adopt a resolution directed against the "ultra-Lefts" in Germany.